And your children are gone. How many times have you heard that nursery rhyme? 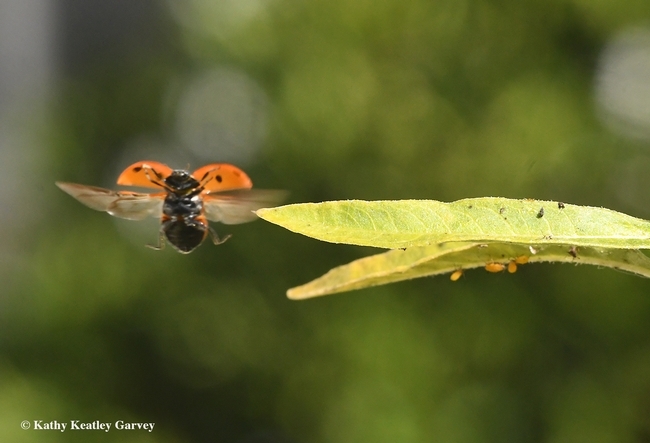 Better yet, how many times have you seen a lady beetle (because they're beetles, not bugs) take off? Look closely for lady beetles in aphid-infested milkweed plants and you might see this phenomenon. 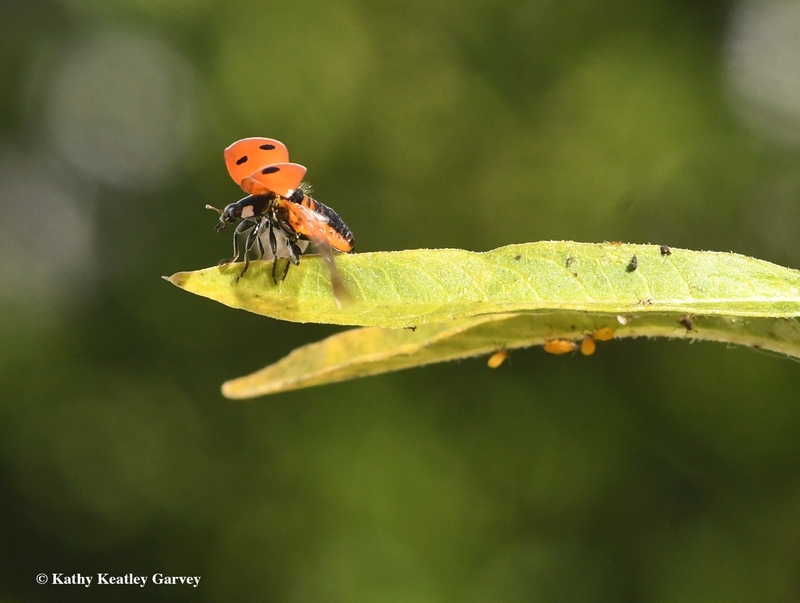 The lady beetle opens its elytra (a modified hardened protective wing case) and out pop the wings. This lady beetle (below) was munching and crunching aphids on a tropical milkweed this afternoon in Vacaville, Calif., and then opted to take flight. Just another beneficial insect eating soft-bodied pests and then heading off to another "restaurant" that features its prey. 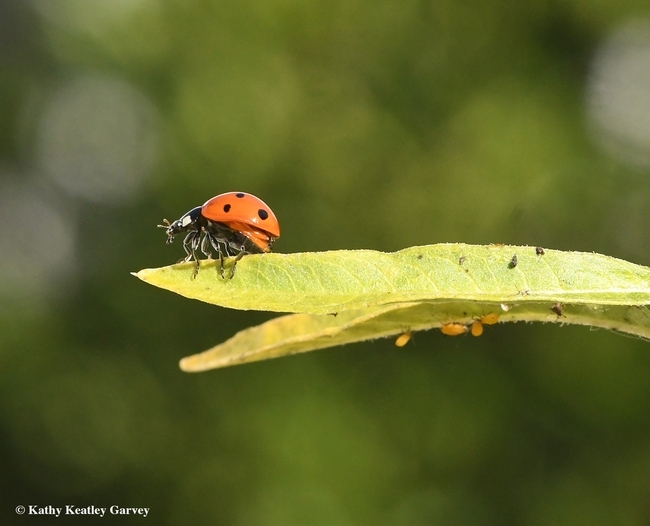 Goes to prove that lady beetles are garden heroes. And when they take flight, they look like super heroes: the superman/superwoman of the garden. You can learn more about lady beetles from the Natural Enemies Gallery, part of the UC Statewide Integrated Pest Management (UC IPM) website. 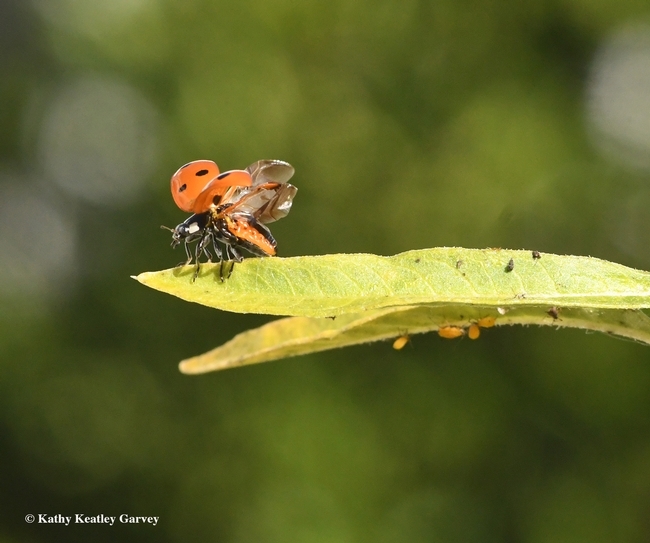 "Although they are extremely important natural enemies of aphids, their propensity to disperse makes it difficult for them to be used in inoculative or inundative biological control programs," UC IPM points out. Tell that to the children chanting the nursery rhyme and they'll probably grow up wanting to learn more about these amazing insects and it's not about their house being on fire: "Their propensity to disperse makes it difficult for them to be used in inoculative or inundative biological control programs." May I please share these photos in my K-2 Environmental Science classes? These are are spectacular and the students are always excited to learn more about lady beetles! Awesomeness! You are so talented!! !